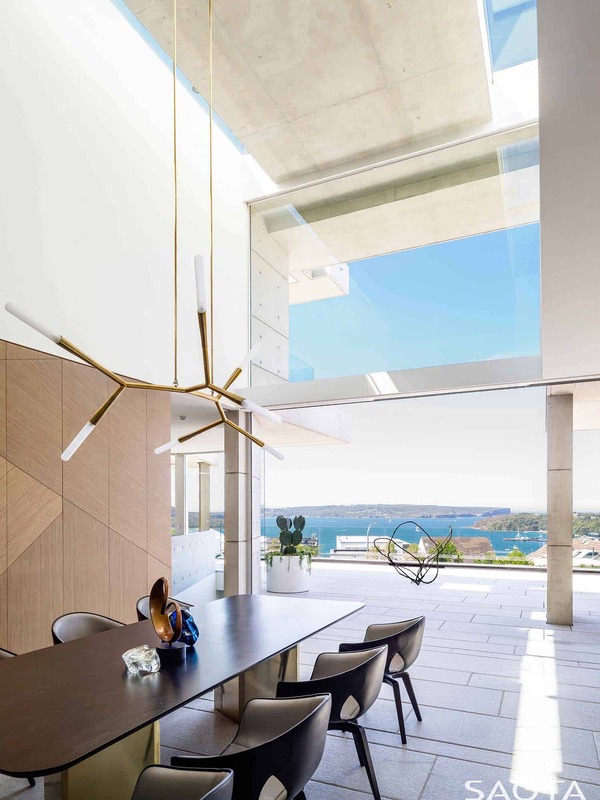 This bold and modern home was commissioned by award-winning architects SAOTA, nestled on the slopes of Mosman, a harborside suburb of Sydney, Australia. 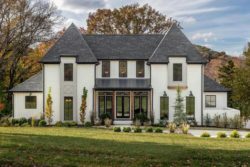 Designed to maximize waterfront views, this home capitalizes on the fantastic climate with an indoor-outdoor lifestyle. 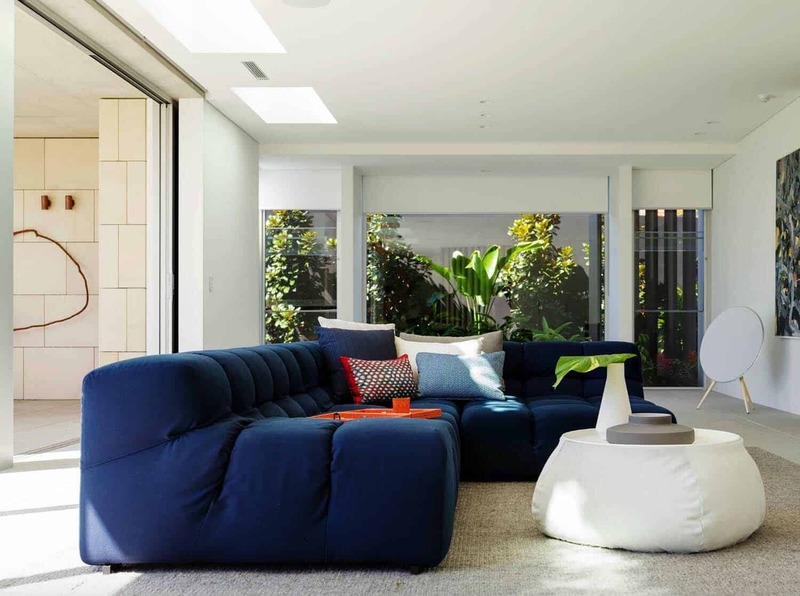 This concrete home was designed for a young family, who is originally from Melbourne. 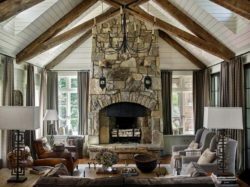 The scope of this project was to soften the interiors of this strong and masculine concrete structure, infusing warmth with casual yet sophisticated undertones—creating an inviting living environment. 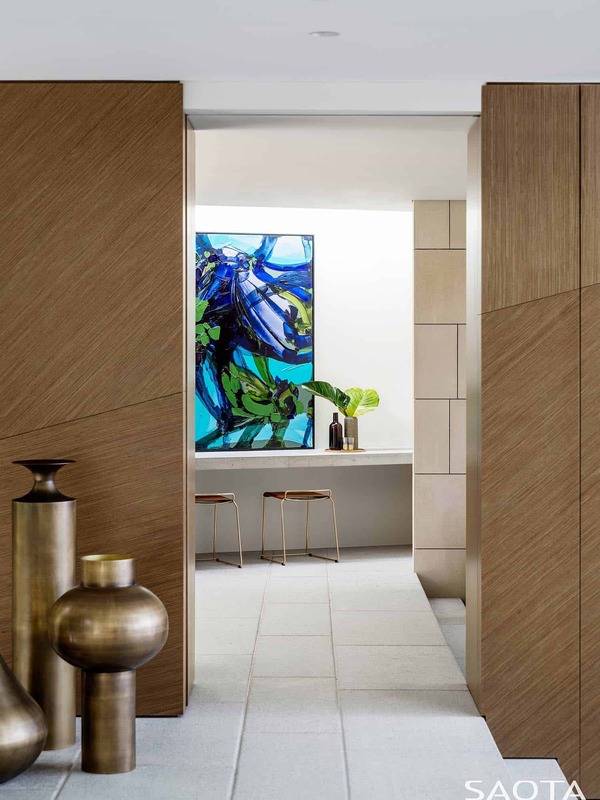 SAOTA worked with Sydney-based TKD Architects to bring the project to life. 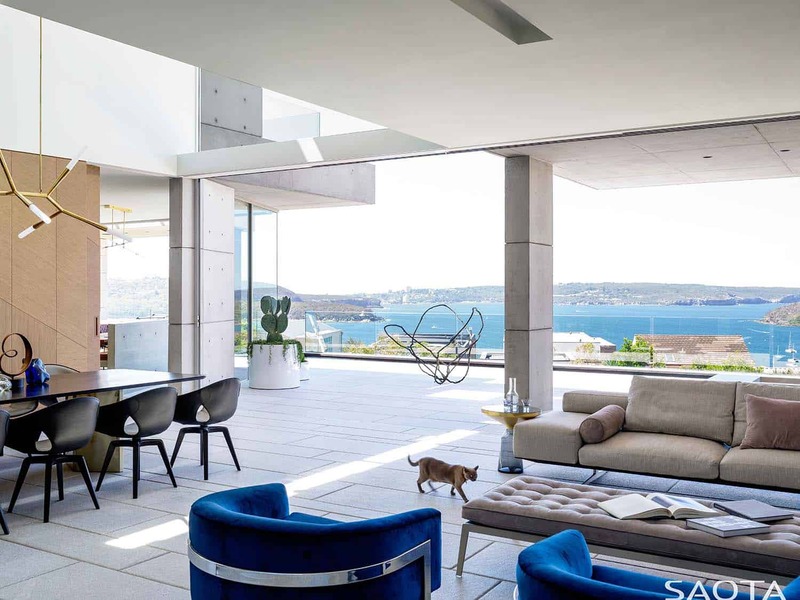 “As Executive Architects, TKD worked closely with the homeowner, ensuring that SAOTA’s detailed design was delivered and a dream home realized. 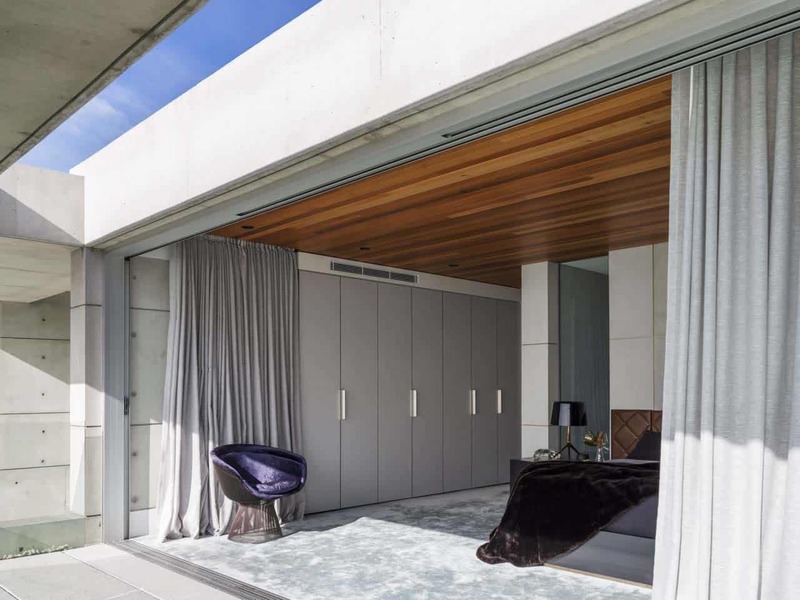 Their creativity and commitment to design excellence was a key success factor,” comments SAOTA Junior Associate, Erin Gibbs. 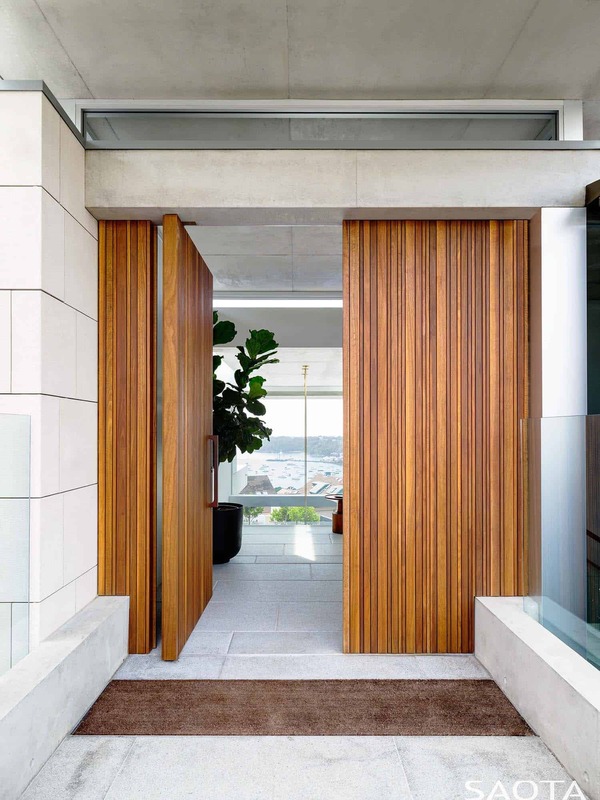 Through the vast wood doors, a double volume entryway features open views right through the house to Sydney Harbor and beyond. 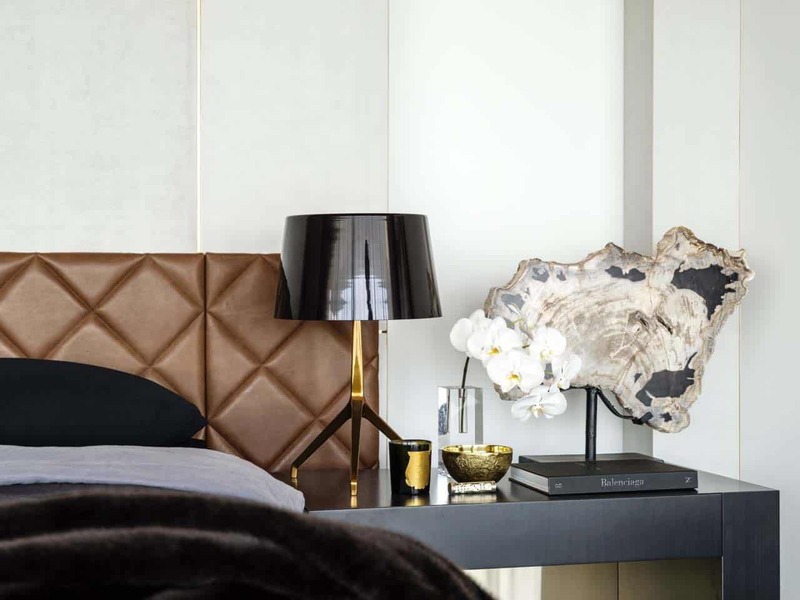 Interior design studio Alexandra Kidd Design was tasked with the interiors scheme of this home. 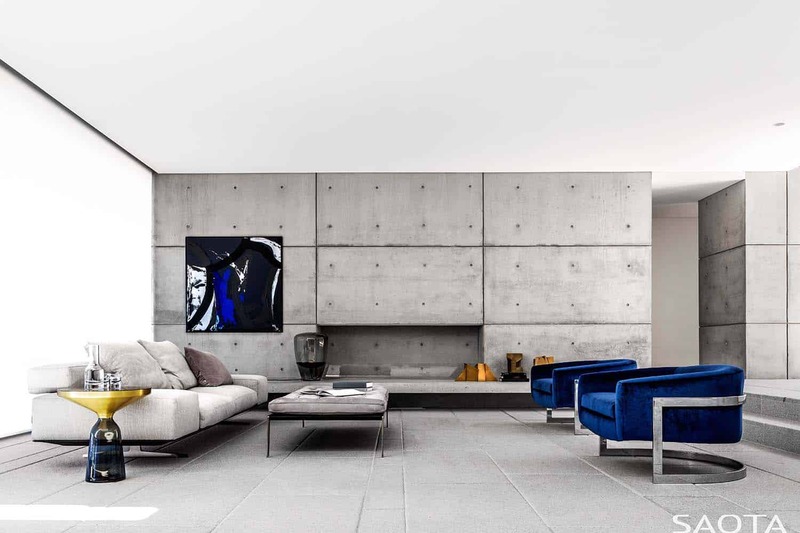 Their task was to add layers of texture to soften the interior of this concrete home. 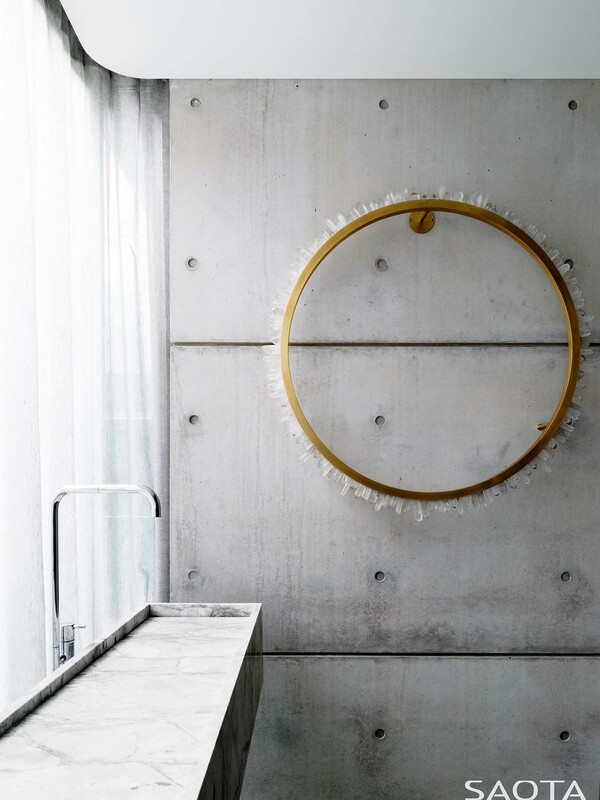 “We played with the contrasts of raw architectural elements and luxurious finishes, juxtaposing concrete and brass, timber and stone, leather and linen, ever-increasing our client’s emotional response to the spaces,” states the designers. 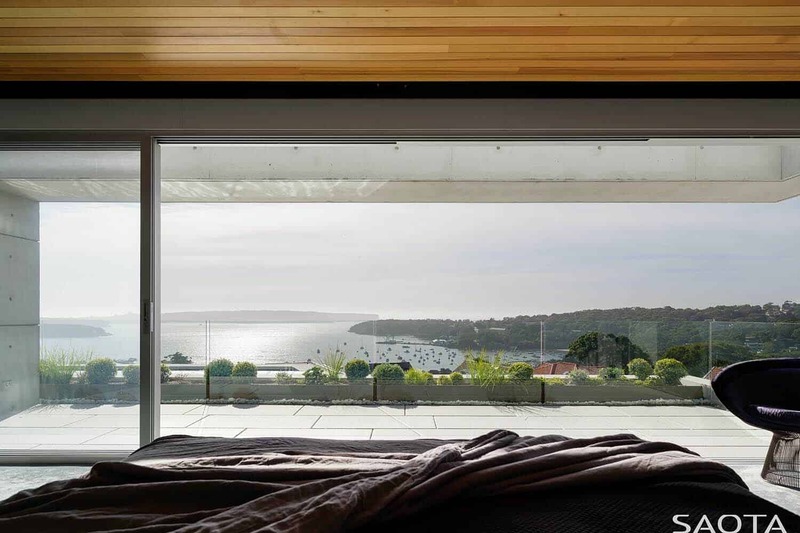 What makes this home unique in the area is its position on two adjacent sites, allowing generously proportioned open living areas and wide access to views. 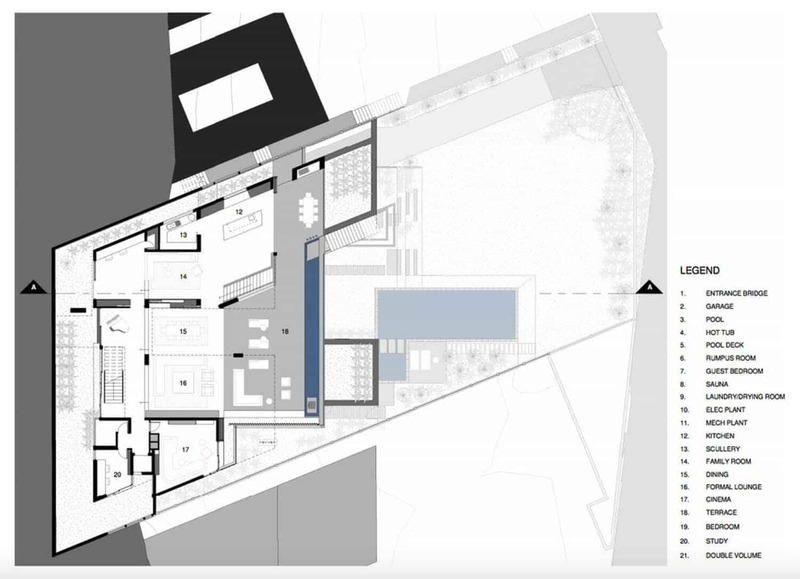 Significantly recessed into the hillside, the main living area is below street level for maximum privacy. 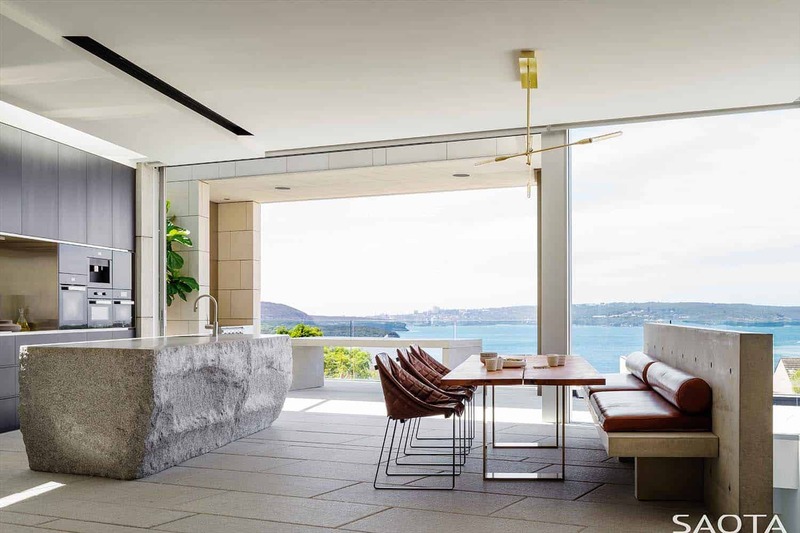 The living area opens on two sides, offering Harbor views to the east and a secluded garden with an exposed rock feature to the west. 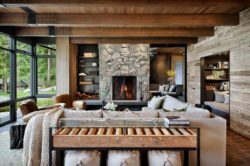 This lends to a sense that one is surrounded by natural elements. 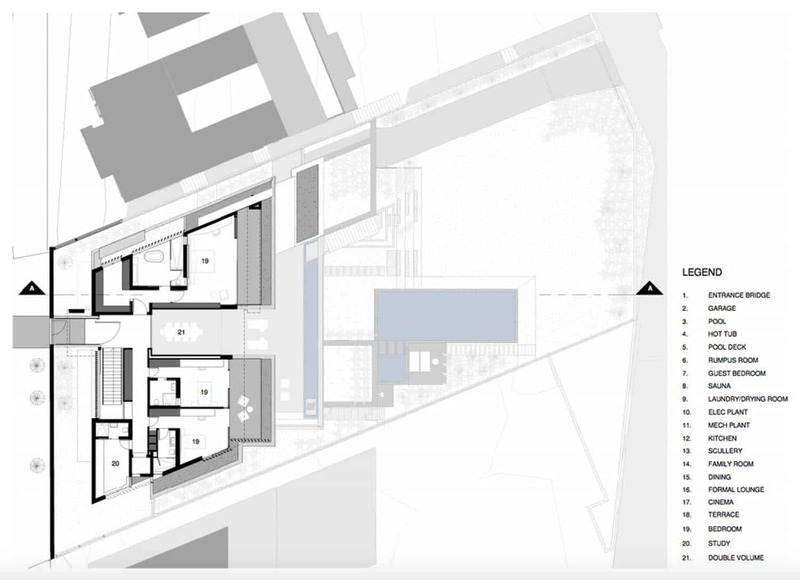 The home is accessible from two streets – the guest entrance on the upper level, and the access to parking garages from the lower street. 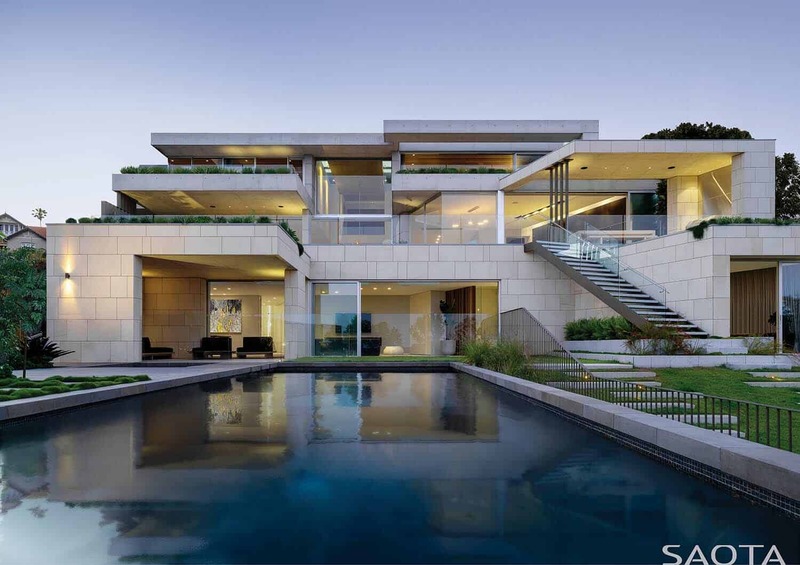 From the water side, the sculptured facade is bold. 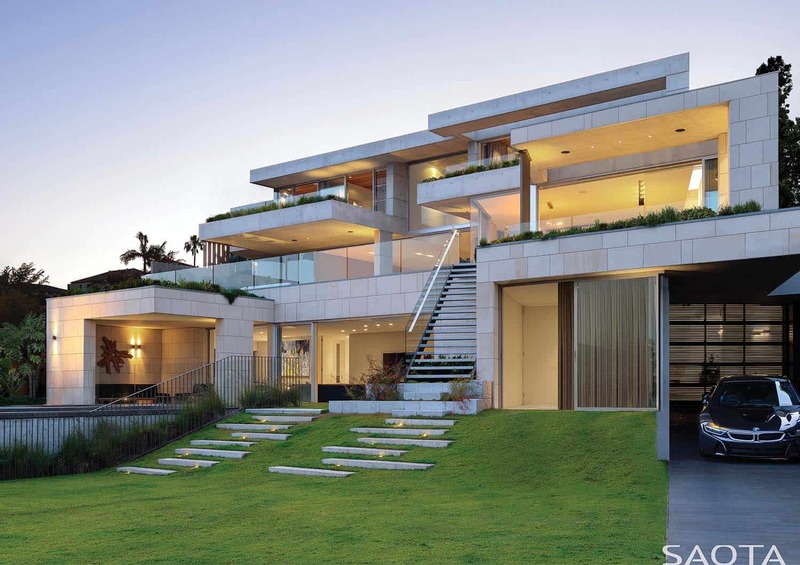 From the street side, the tone and style is more understated. 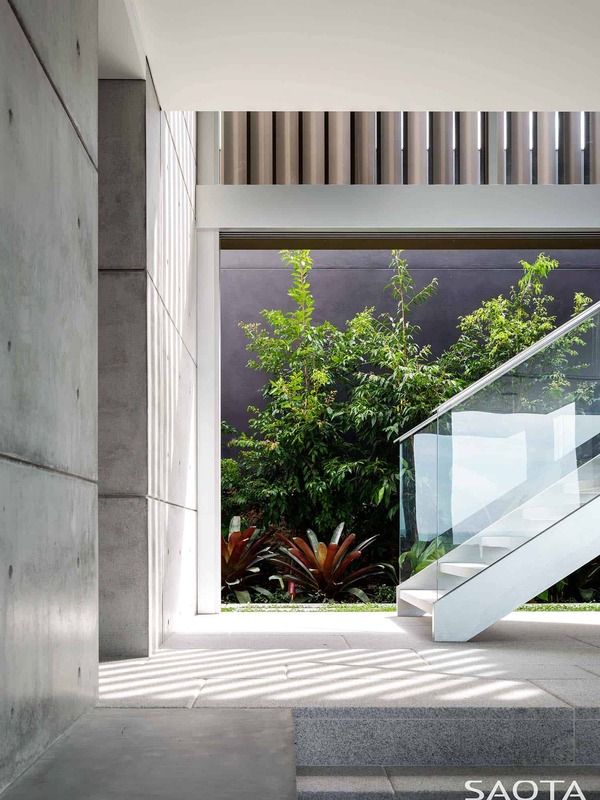 Guests enter through a wooden entrance door and over a bridge that crosses the garden below. 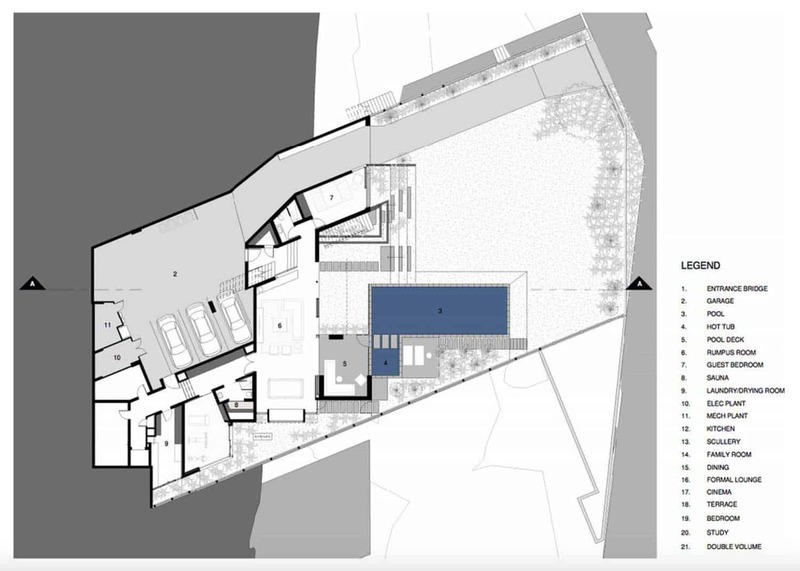 On the main level, the outdoor space includes a covered outdoor lounge and dining area, as well as bedrooms which float above the underlying platforms. 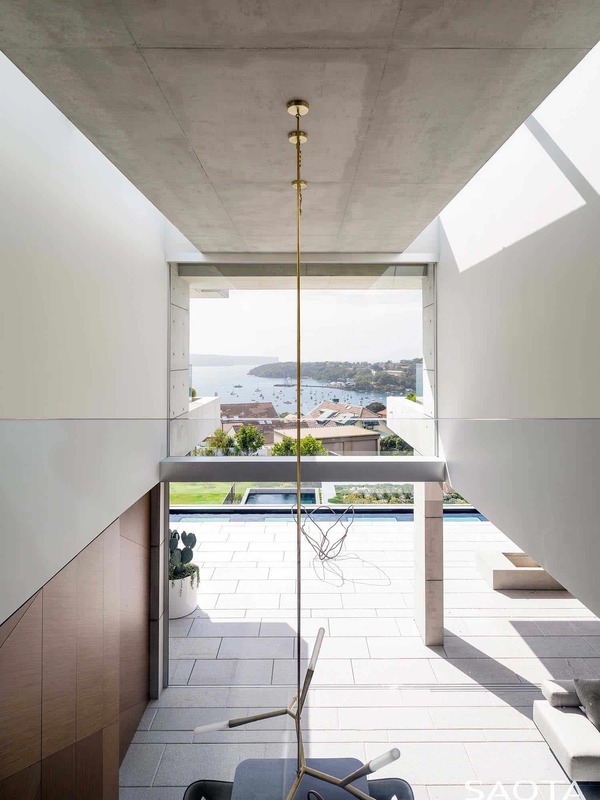 A shallow water feature that wraps the area picks up the element of water from the Harbor, creating a natural edge to the spacious main terrace. On the lower level, a covered outdoor area leads directly to the pool, with its secluded hot tub as part of the body of water. 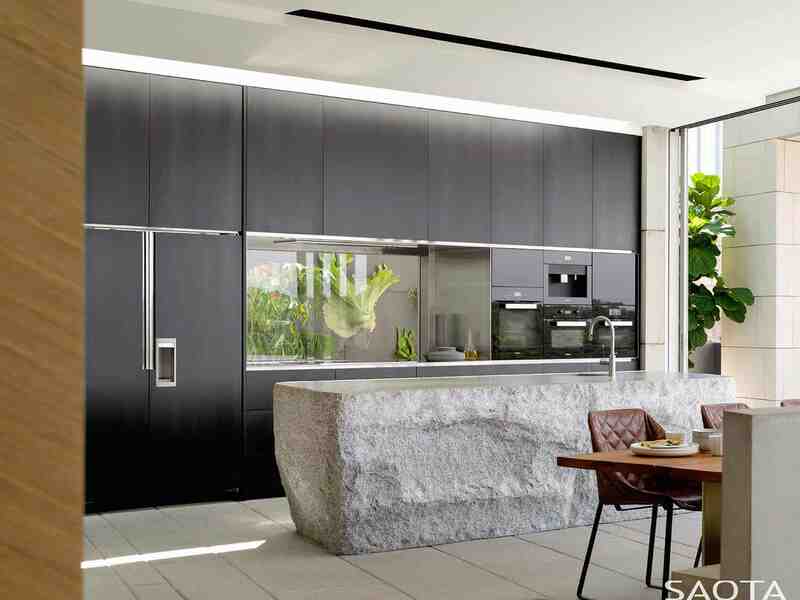 The dark granite hues of the pool are on trend and have a more monolithic recessive character. 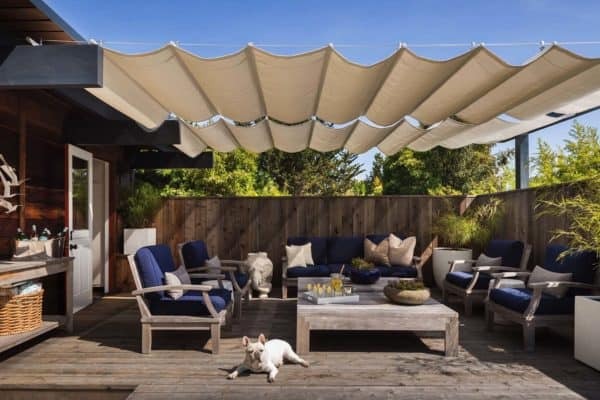 The covered outdoor easy living space is complemented with an uncovered deck ideal for capturing the warmth of the winter sun. The sense of connection to the water in the Harbor is enhanced through water features on both the upper and lower living areas. Adding to the glamour and story, the use of electric blue in the interiors further picks up the magical blues in the vista. 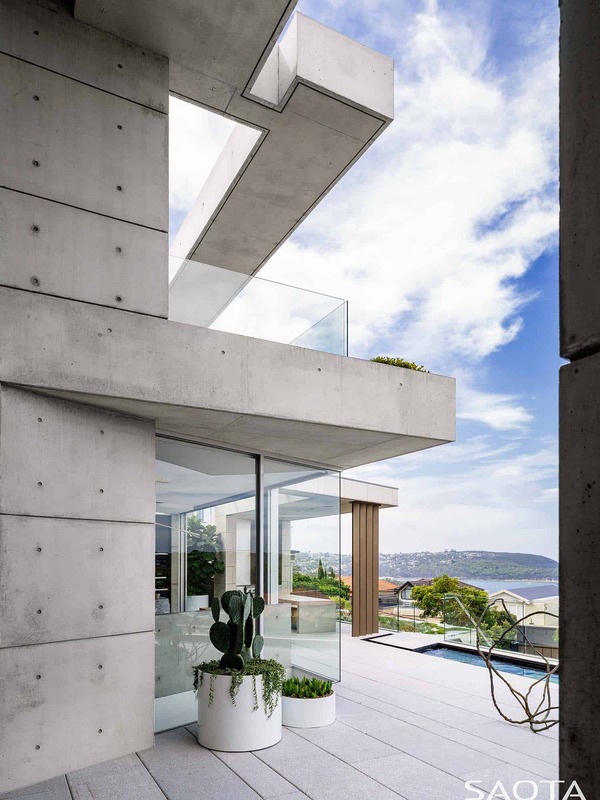 Throughout the house, pristine concrete work combines with sandstone cladding. 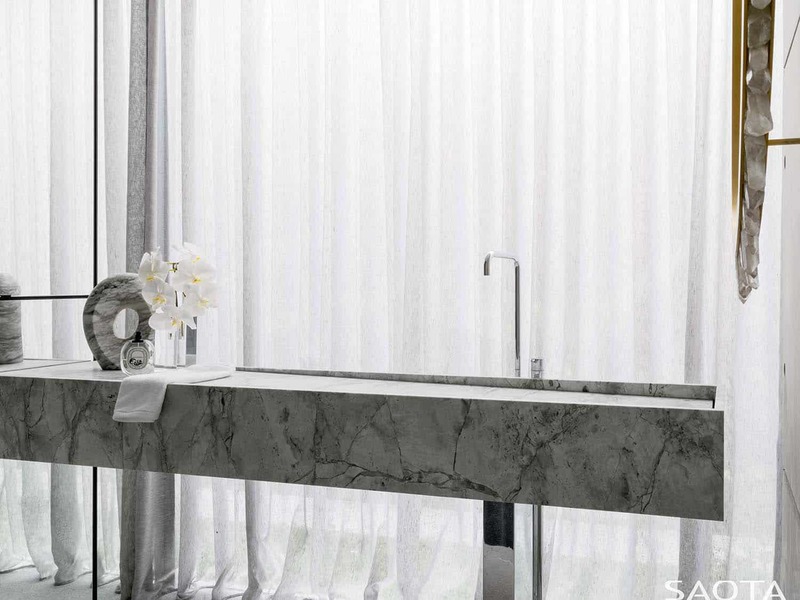 Abundant to the area, this natural stone has been used in a contemporary way. 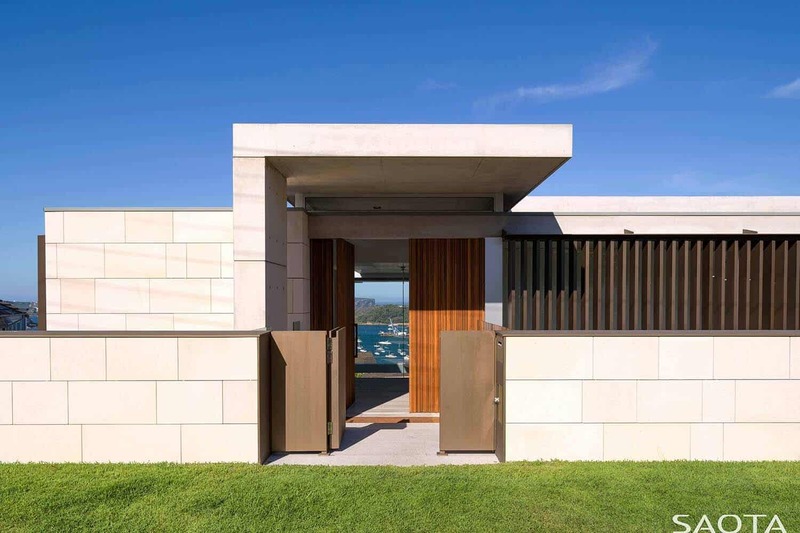 This light tone of the sandstone is offset with warm textures of wood and bronze used for internal cladding and screening. 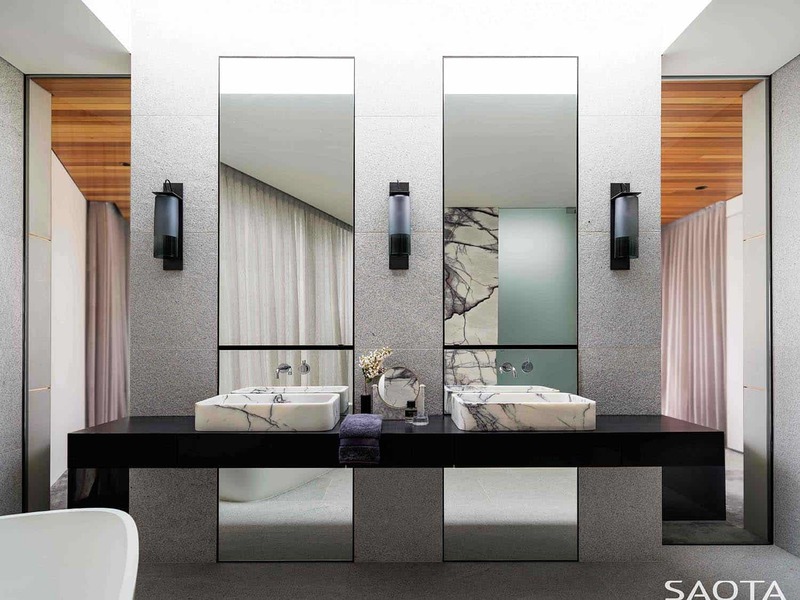 Feature pieces such as a hand-cut grey granite counter further showcase and contrast the pristine craftsmanship. The approach to privacy is multi-layered. 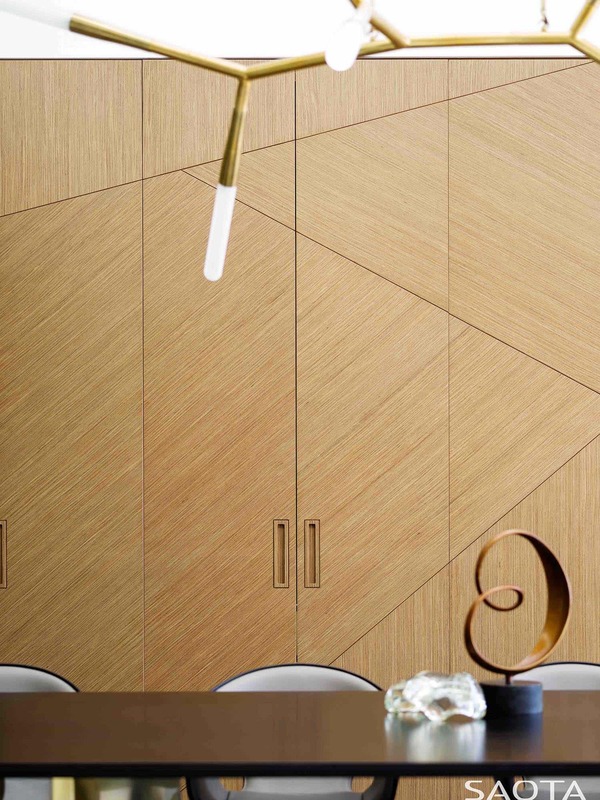 Angled bronzed louvres are used to maximize view out, while minimizing views inwards. Further motorized screening adjacent to the entrance allows the option of maximum light when open or privacy from the street when closed. 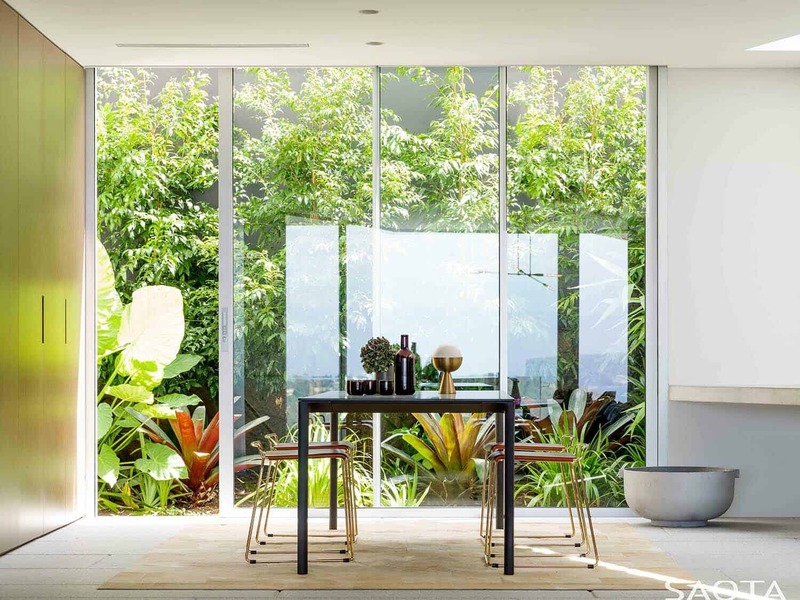 What We Love: This spectacular dream home is an architectural masterpiece, from indoors to out. 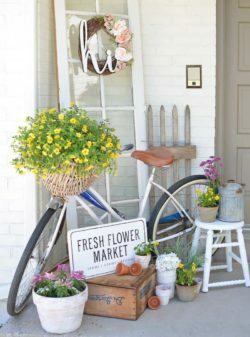 The location itself is stunning and the home just adds to the beauty of the site. 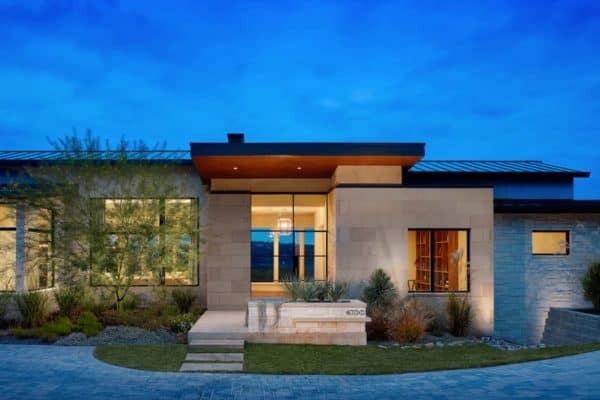 Layered down the hillside, we love how the home looks understated from the street and the main living spaces are below street level for privacy. Stand out elements: the exquisite kitchen counter, stylish furnishings, use of skylights for natural light… and those views! 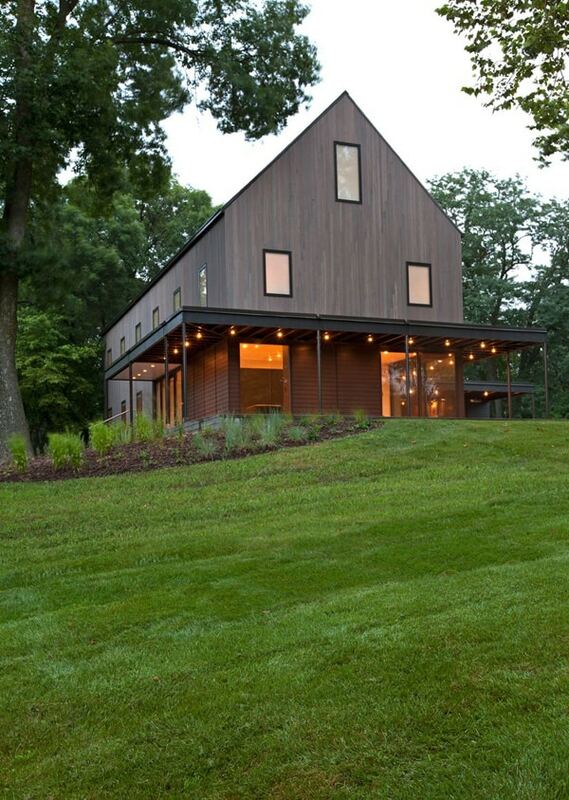 Readers, please share with us in the Comments what you think of the overall design of this home? 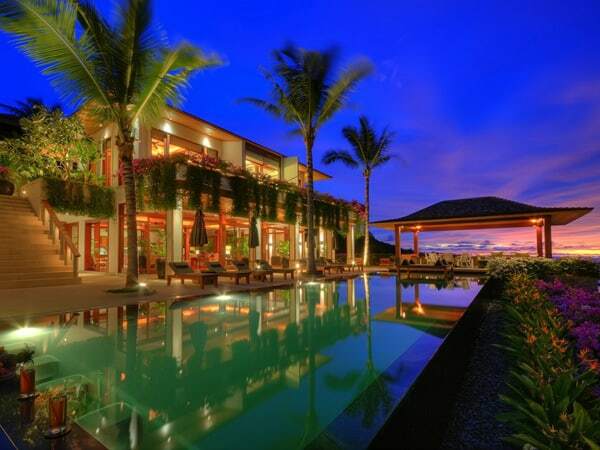 Would you consider this to be your idea of a dream home? 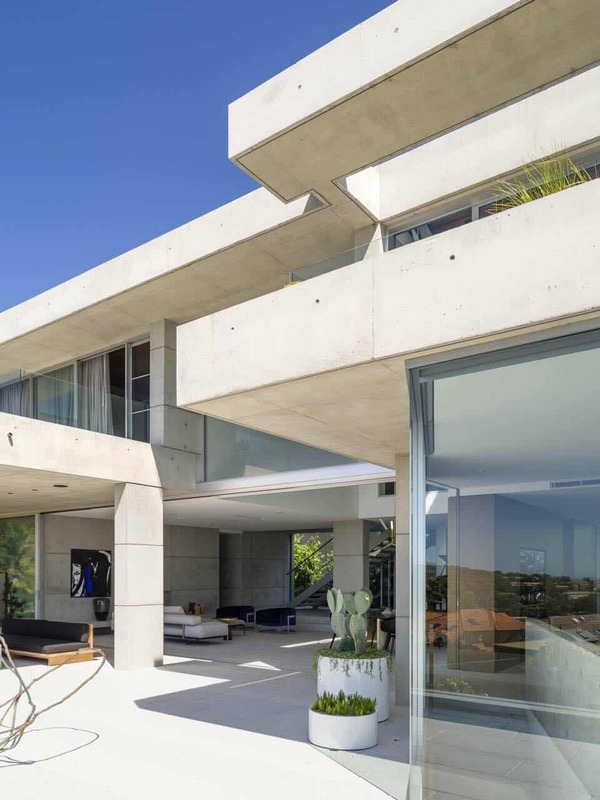 In addition to the abundant living spaces, the home comprises five bedrooms, a sauna, gym, wine cellar and a cinema room – complete with roll down screen, the latest in audio-visual technology and block out blinds.